Why do we have war? Where does it come from? 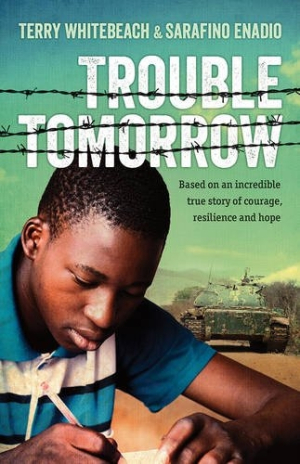 Trouble Tomorrow explores the origins of conflict through the story of a child soldier in modern Sudan. Based on a true story, the book follows Obulejo as he escapes a Sudanese militia and tries to find safety in a Kenyan refugee camp. Tough, honest, and unsparing, Trouble Tomorrow is an intense look at how war affects young people. The novel is written in the present tense, making its details and dialogue even more intense. At times, it’s unclear whether Obulejo will survive. Throughout the book, his odds are never good. His struggle is human, visceral. Dehydration, armed strangers, and lack of shelter are only a few of the dangers he must contend with in order to make it to safety in Kenya. But no matter how frightening things become, Obulejo is still a young man with a foot in childhood—reunited with his friend Ochan, the boys “dance around each other like puppies”—though coming into himself, deciding who he is and what his values are. Terry Whitebeach and Sarafino Wani Enadio don’t paint Obulejo as a saint. He’s a person, trapped in a crisis. Several times, Obulejo steals or harasses others; he’s forced to act against his principles. These realistic scenes, and Obulejo’s reactions, make it easy to imagine what we’d do in the same situation. With clear, emotional storytelling, Trouble Tomorrow brings the Sudanese conflict into the light in a way that educates and illuminates the often-ignored consequences of war in Africa.